Planning of water resource development involves ensuring the availability of water in the required quantity and appropriate quality. Unfortunately water is getting polluted day by day due to different anthropogenic activities. So it is burning need, to conserve the water and prevent it from every type of pollution. There should be proper water investigation and management. This could be possible by continuous Water Quality Monitoring of commercial activities in the urban environment and from industrial sites. Biological water quality is particularly important because of potential health problems related to water borne diseases. Monitoring for establishing baseline water quality. Observing trend in water quality changes. Calculating of flux of water constituents of interest. 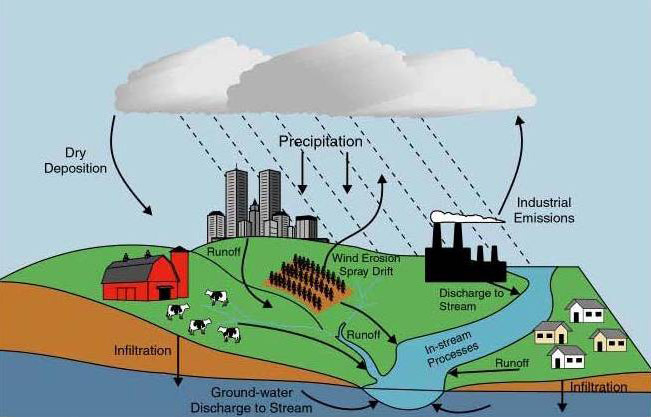 Control and management of water pollution. The CWC, CGWB, CPCB and GSDA maintained monitoring networks which provide an overview of the nation wide SW & GW water quality. The responsibility of the state is to preserve the adequate water quality standards in the state. The part of mandate of the state agencies participating in HP is trend detection and testing on compliance of water quality to ceiling levels for specific purposes. The State and Central networks are optimized to avoid duplication. Level - I Laboratories - Level I laboratories are located at surface water flow gauging sites and are equipped to measure in-situ certain parameters such as Colour , Odour, Temperature, Ec and pH which needs to be determined in 24 hours. 2-3 adjacent gauging sites followed by WQ sampling locations can be covered from one level I laboratory. Total 38 level I laboratories are established in the state. Sediment analysis is also in the scope of Level-I labratories . Level II laboratories - To perform physical, chemical & bilological Analysis for collected samples with field tests through Level I laboratory in prescribed period from WQ sampling locations as per approved Network. Six well equipped Level II laboratories are established & are in operational . The water quality information should be easily accessible at state and national level for planning and management purpose. Under HP, computerized data management system for storing and processing of water quality information is set up in the data centers. The state and central WQ data management systems is fully compatible and complimentary..
Data which can be obtained from other monitoring agencies. The basic water quality data stored in the state level data bank at Nashik(MS) would be easily accessible and readily available to all authorized users in an appropriate format. In addition, consolidated overviews of the current status of water quality in the state would be published regularly and relevant result of research would be disseminated widely.